Love the over effect of the product but will comment in review section. Advantix 11 is a great product that WORKS!!!! 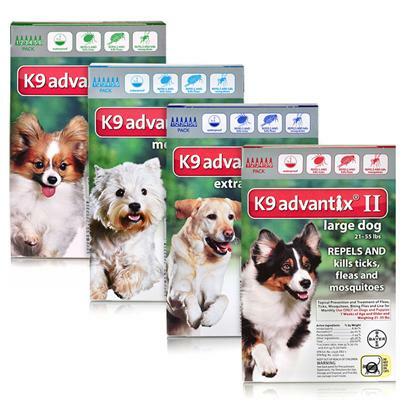 This product has been very effective in treating fleas. Tried the rest, this one's the best. Could be easier to get out of package. This is the first time since I have been using this product that it has not worked. Have used all of the top brands on the market. Advantix is by far the best and is one of the only brands that also includes mosquito protection. Our dogs have never looked so good! Kills all fleas on my dogs within twelve hours..ALL OF THEM! This does everything it claims to do. this product helps control ticks and fleas. Good overall product for flea protection. Works where other brands did not..
Works well for my dogs. Effective in stopping the fleas! Keep Fleas & Ticks away! this product does not work for fleas . a waste of money . Great product. I have used it since it came out. i have used for few years. it works. Great product, helps with my dogs arthritis without upsetting his stomach. works better than any other brand we've tried! very easy to use not too messy. This is the only med that keeps my large dog flea free. put this on my dog the 15th of June found two ticks, today!